The Eiffel Tower is by far Paris' most-recognized icon. Wildly unpopular when it was unveiled and nearly torn down, the tower was finally embraced as the symbol of a modern and elegant Paris. It remains one of Paris' must see attractions is one of the most photographed monuments in the world. It's also one of the most Instagrammable places in Paris, and rightly so as it captures the romance and beauty of this French capital. There are several affordable and cheap guided tour options for a behind-the scenes, detailed look at the tower and the history of its conception and construction. Skip the line for the Eiffel Tower and see Paris’s romantic skyline from the top. Don’t wait in line for hours when you could be seeing the sights. Make the most of your time in the French capital and if you’ve always dreamed of visiting the Eiffel Tower, pre-book your skip-the-line ticket straight to the 2nd floor! With special access, you&apos;ll avoid the long general entry queues, gaining faster access to the privileged vantage point overlooking the City of Light. Start your small group tour, of 25 people or less, from the manicured gardens of Trocadero Plaza; by far the best vantage point from which to photograph the Eiffel Tower. Follow your expert guide across the Iena Bridge to the base of the Eiffel Tower, listening all the while to the fascinating story of the Eiffel Tower’s architecture and history. Cruise past the hordes of tourists crumpled up in line, and head up to the 2nd floor with your guide. Hear how the Eiffel Tower was nearly demolished in 1909 and learn about the interesting tale of the man behind the Eiffel Tower, Gustave Eiffel! Your english-speaking guide will accompany you to the dedicated observation deck on the second level. Enjoy your guide’s insightful and entertaining commentary about the marvels that lay at your feet. After touring Paris from above, you will have the opportunity to buy a ticket to the summit if you so wish. Watch the sunset over Paris from the top of the Eiffel Tower on a small group guided tour, with skip-the-line access to the 2nd level. Experience breathtaking views of Paris, and watch the lights come on at dusk. Breeze past the long lines with your pre-booked ticket, and save valuable time as you go straight up to the observation platform. Marvel at panoramic views of the city at dusk, and see landmark monuments such as the Sacre-Coeur, Notre-Dame and River Seine. 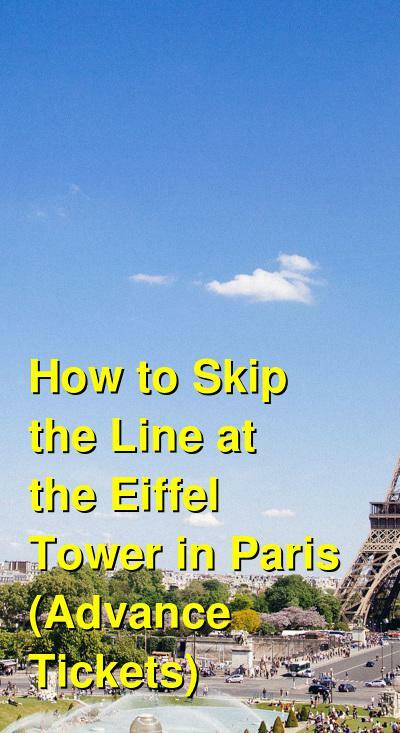 Your guide will entertain you with anecdotes about the Eiffel Tower&apos;s history and construction, explaining the difficulties Gustave Eiffel encountered to get it built. You will also learn about the World Fair, held in Paris in 1889, and its most enduring monument. You are then free to choose if you’d like to go to the Tower&apos;s top level, where you can spend as much time as you like before descending on your own. Experience Paris from 2 unique viewpoints! First, enjoy a 1.5-hour sightseeing bus tour of the city with expert commentary. Then, take an elevator ride to the 2nd floor of the Eiffel Tower, where you can also opt to purchase tickets to go to the famous 3rd floor! Climb aboard an air-conditioned double-decker bus to admire Opera Square and the Obelisk of Concorde Square. Cruise down the Champs-Elysees to see the Arc de Triomphe. See the Eiffel Tower over Trocadero Square. View Notre-Dame Cathedral, Invalides, Pont Neuf, Bastille Square, the Luxembourg Gardens and more. Headphones with recorded commentary in 11 languages are available during the bus ride. Next, visit the most famous monument in Paris – the Eiffel Tower. Skip the line and journey to the 2nd floor for a great view of the city. Want to go all the way to the 3rd floor? You can purchase tickets at the Eiffel Tower, depending on availability. Your tour ends here, so stay as long as you like to enjoy amazing views of Paris! Experience Paris with this combination tour. Start off with a bus tour of Paris and then enjoy a Seine River cruise. Finally, head to the Eiffel Tower&apos;s 2nd floor for spectacular views of the city – with priority entrance! See the best Paris has to offer on a 4-hour combined tour. Start out by hopping on board an air-conditioned double-decker bus to take in the city&apos;s top sights. See Opera Square, the Obelisk at Concorde Square, and the Champs-Elysees. You&apos;ll also take in the Arc de Triomphe, Bastille Square, the Luxembourg Gardens, and more. You&apos;ll have views of Notre-Dame Cathedral as well before arriving at the Eiffel Tower, which soars over Trocadero Square. Next you&apos;ll cruise along the Seine River on a glass-enclosed trimaran – one of the Bateaux Parisiens – perfect for sightseeing! Your cruise departs from the base of the Eiffel Tower. On board the river cruise, you can listen to commentaries and music evoking the city’s past, broadcast through individual handsets. The audio is available in 13 languages and features a children’s version, available in French only. From the water you&apos;ll enjoy spectacular views of the Musee d’Orsay, Notre-Dame Cathedral, the Louvre, Concorde Square, the Chaillot Palace, and other major sites as you cruise along the world-famous river. Finally, you will visit the most famous monument in Paris – the Eiffel Tower. Ascend to the 2nd floor for stunning views of the City of Light. Although the tour ends here, you&apos;re welcome to stay as long as you like to enjoy the aerial views of Paris! Spend an exciting and romantic evening in Paris, the city of love, with a 3-course dinner at the elegant first-floor restaurant of the Eiffel Tower and a 1-hour cruise of the River Seine. Travel by deluxe, air-conditioned minibus to the cruise embarkation point, and then cruise through the heart of Paris on board a glass-covered trimaran, perfect for sightseeing. Enjoy a lively commentary of anecdotes, and unique cultural references, via individual handsets, available in German, English, Korean, Chinese, Spanish, French, Italian, Japanese, Dutch, Polish, Portuguese, and Russian. A guide will also take the microphone to enrich the commentary with information about the latest events in Paris, such as temporary exhibitions, shows, cultural, and sports events. 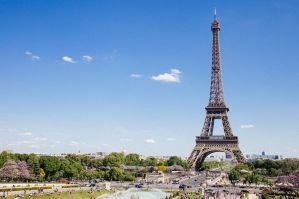 After your informative Seine River cruise, hop back on the air-conditioned minibus and head for the Eiffel Tower, where you will enjoy an elegant dinner at “58 Tour Eiffel” on the first floor of the iconic attraction. Skip the lines, and take the elevator, for your priority access. Settle down to a 3-course meal, complete with extensive panoramic views of all Paris below.